In the late Autumn, when the girls were little, we used to pay them a nickel for every falling leaf they could catch, before it hit the ground. 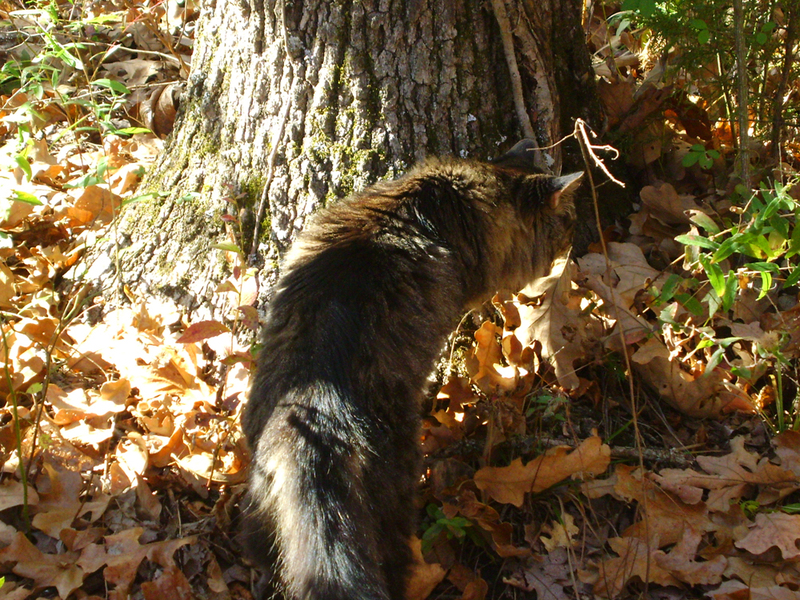 This led to all kinds of fun as they intently ran around through our deeply wooded back yard, grasping and leaping towards the swirling dried oak leaves. Dozens and dozens of leaves would spin right toward them, and then at the last moment, deviously lurch just out of reach, before cascading to the ground creating a carpet so thick, we’d literally have to wade through it. An afternoon of this silly fun typically cost us very little, because it’s really hard to catch a falling leaf. Afterward, we would rake the leaves into huge piles, many feet tall, and they would take flying leaps, or Bruce would toss them in, completely burying themselves in the crunching mass, arms and legs sticking out in every direction. After a great amount of rolling and rustling about, they’d finally emerge, broken leaves stuck all over them, head to foot. 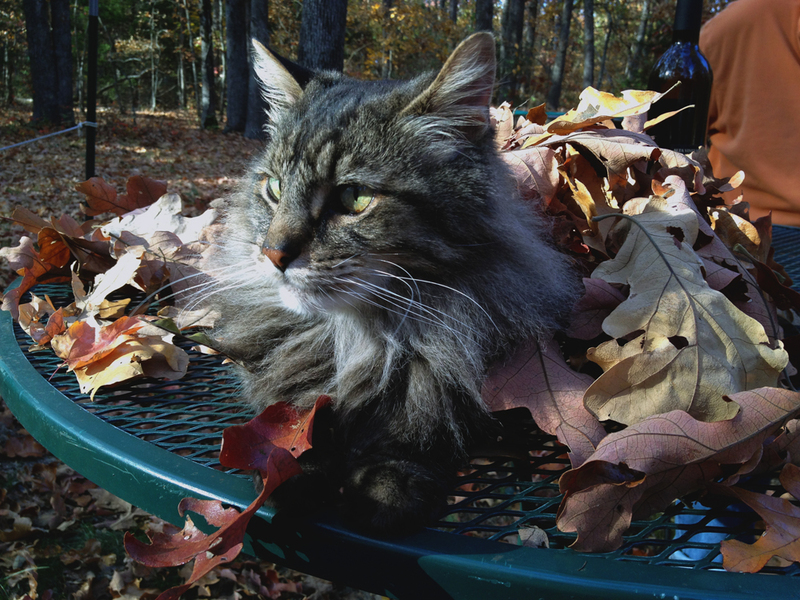 Our cat Nigel, young at the time, always fell prey to escapades with leaves, repeatedly being tossed into the pile, where he would scamper about and then emerge at a full run across the yard, leaves clinging to his long fur, only to return for more of the same. What great fun. Finally, we’d begin the task of raking the huge piles onto the fire pit in the back yard, carefully working the barrier with rakes while we set them aflame, creating a crackling volcano of smoke and fire. What is it about the hypnotic lure of this great seasonal tradition? I absolutely love the smell of burning leaves. We did accidentally set our woods on fire once years ago during our kitchen remodel, when Bruce put out some large boxes to burn in a barrel while our ovens were being installed. One of the crew came in and said, “I assume you mean for your woods out back to be on fire?” Holy Crap! Out we all ran with rakes, including our general contractor, and it took us nearly an hour to contain the giant circle of scorched leaves amidst the trees. We used to have brambles of blackberries back there, but that pretty much took care of those. Fortunately, that was the extent of the damage, and the end of our use of a burn barrel. Our redwood sided house sits amidst six acres of thick forest, under waving, towering oak trees at least sixty feet tall. For a long time, we used a walking trail Bruce created through the first three acres, and when we acquired three more acres to the east, we extended the trail. We’d walk it early mornings with Nigel trailing along, distractedly letting us get too far ahead, such that he would pretend he was lost, and yowl imploringly for us. So we’d stop and call out to him, only to have him come flying toward us, blazing through the wild brush underfoot, until he rapidly caught up, only to get distracted again by some buzzing only he could hear. We haven’t used the trail much since I had ACL Reconstruction on my left knee in 2010. The path is a bit rough, with hidden tree roots, uneven earth and vines ready to grab at any moment. A couple of years ago, we heard target practice coming from the house three acres away. This wasn’t the first time those neighbors had decided to shoot toward our woods, and we’d advised them we walk through there. Bruce found their name in the phone book, and called to ask what they were shooting with, and she said, “Oh, it’s just a potato gun”. I recall a New Year’s party a long time ago with people catapulting potatoes through the air, which baffled me, but a potato gun was a new one on me! So Bruce asked if it had bullets, and she said yes. What potatoes have to do with that, I don’t know, but he told her to stop shooting into our woods because we walk there. This last spring, we once again heard the shooting, so this time I called her up and asked if they were shooting at our woods again. “No”, she replied testily, “we’re shooting towards Margaret’s”. I have no clue who Margaret is, but I’m wondering, does Margaret know she’s being shot at?! This is what we get for living in the county. So we finished our hasty discourse with additional warnings that we walk through our woods that border their land. We’re considering refurbishing our trail, this time clearing roots and layering a nice gravel path for stability. But I do wonder if I’ll need to keep a sidearm on me. 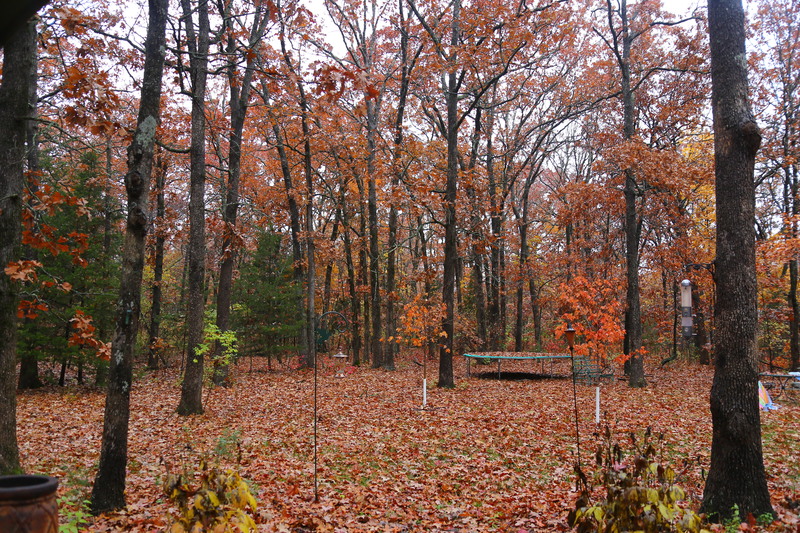 And so, all the leaves are brown and the falling has commenced in our forest once again. We arrived home in time for a couple of days of color as the large oak leaves turned a brownish red, at times scarlet when over-lit by the sun, the strong trees backed by yellow underbrush and colorful red Virginia Creeper clambering high into the branches. Last year, we planted two sugar maples to add more color. They are a marvel when they mature, a cacophony of green, yellow, orange and red all in one glorious tree. The Japanese maple is stunning in a rich crimson red. When the big winds come, usually over a couple of days, the leaves cascade down in droves, a constant progression, until the trees empty their arms for the season. It’s beautiful to watch, but comes with a sad melancholy this year as we mourn Nigel not sharing this with us, his trampoline now heaped in brown leaves. We know, in time, the memories we share of him will replace the sadness, but for now, in my favorite season, this Falling is difficult. Nigel was the great equalizer in our family. Through thick and thin, good times and bad, for better or for worse, he remained neutral, loving us each equally, and in turn, equally loved and adored by each of us. You could have had the worst day ever, and there would be that silly little face, expressionless, and adorable, lifting your spirits just by looking at him. He would lap dance around the room, relocating himself to his advantage, based on who was the most interesting at any time, as a quiet competition ensued amongst us. If Heather was in the chair knitting, he’d be with her, patiently waiting until she cut off a long strand of yarn for him. Sometimes, he would literally just lay across her legs on the ottoman, and watch her knit. Hannah would keep him running back and forth and back and forth, sending his rolly balls in all directions as he chased about like the wind. 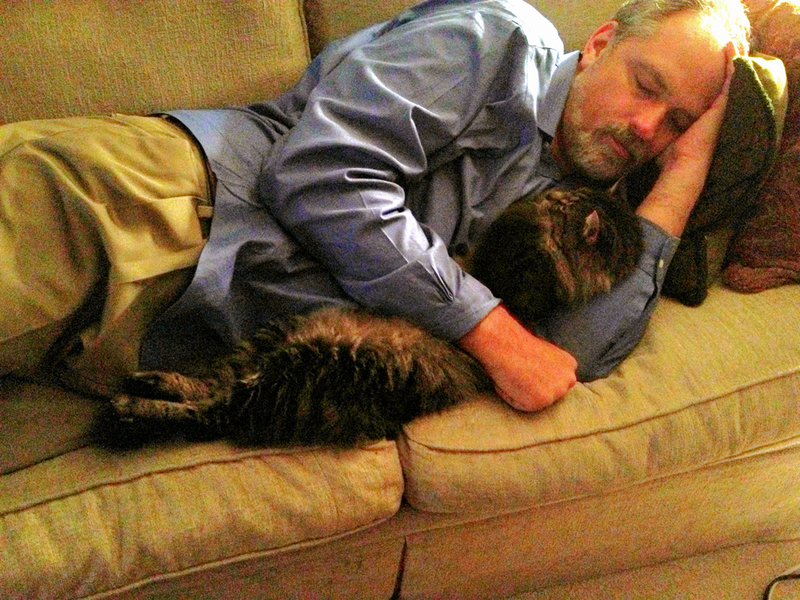 Bruce would get his attention in the evenings when it was time to stretch out long across his body, both taking in a good snooze. And me, well, wherever I would go, he would usually follow, because we had an unbreakable bond. A card arrived today from Debbie and Lori, which stated correctly that even soul-mates can have tails. Next week we head out for the second and last leg of our sabbatical, a month in New Zealand, in the land of Mordor, where Orcs roam the hillsides, where the Misty Mountains tower in majesty to the south, and where Frodo and Sam will save us from the One Ring in the Fires of Mount Doom. We will seek out the Light of Earendil, a most beloved star, and a light in dark places when all other lights go out. The Autumnal Equinox officially arrived in France at 9:44 Sunday night, during the time that Bruce and I were snuggled in by candlelight, watching the movie Chocolat, after our first day in Semur en Auxois. That means yesterday was the first full day of Autumn, and for the next six weeks, we’ll be watching the leaves turn gold, russet and copper, while the brisk, cooler weather settles into the Burgundy countryside. I’ve read there will be the smell of burning chestnut branches on the wind. We’ll have to wait and see about that. We’re well outfitted for the fall, with our cottage fireplace, and plenty of wood stacked beside the house. Remaining on our quest is an outdoor chiminea or copper kettle in which to burn our own little fires “en exterior”, but first, we have to figure out how to describe such a thing in French. Sunday also marked the Equinox or halfway point of the Europe leg of our sabbatical, and my how the time has flown! We’ve been startled by how quickly the weeks have progressed, and other than missing our girls and Baby Nigel Joseph McMillin, we’re not really homesick, which also surprises me. Months went into planning each locale, things to do, places to stay and to eat, all carefully stored in “Evernote” for quick reference. Half of those notebooks are now obsolete, at least for now. But not obsolete are the incredible memories we’ve made so far. Two delightful weeks in London along the Thames, followed by a week in Paris with our girls. We all ended that week a little worse for wear with colds, but Paris was a delight. 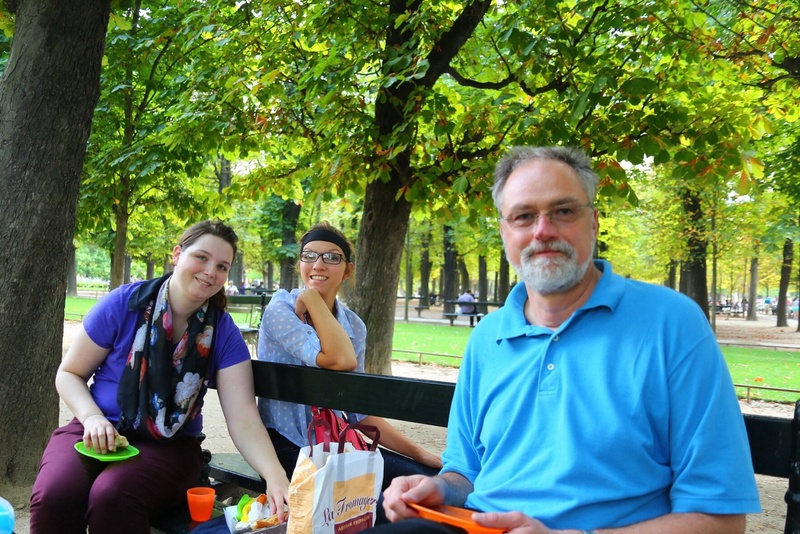 For me, the best was the family picnic in the Luxembourg Gardens, and then sitting by the Medici Fountain with Heather while she tried to knit, but was distracted by the people milling about, and the ducks swimming about and nibbling against the moss on the wet stone, while Bruce and Hannah wandered off to the Catacombs. A couple of days later, Heather was down with a fever, and Bruce had his own terrible cold, so Hannah and I ventured out on the Hop On, Hop Off bus. I realize those look terribly touristy, but I have to say, they are a total delight. We sat up top, watching the beautiful streets of Paris go by and completely enjoying ourselves, while having several giggles of silliness along the way, as girls are known to do. We disembarked at Galleries Lafayette so Hannah could seek out a lovely plaid cashmere scarf for her amour. I bought a scarf for myself from the same men’s section, in muted colors of navy, gray and lavender. I’m thinking it will be perfect with a pair of jeans. On our way back, knowing that nobody would feel like going out, Hannah and I stopped for the most fabulous quiches from the little brasserie right next door to our apartment, which was also to be our boulangerie for the entire week. Hannah is not an egg person, and had never tried the “Madame Fromage” quiche I make at home, a decadent creation full of eggs, cream, bacon and caramelized onions. But she ate the quiche from Paris with gusto, and has been dreaming of it, along with the croissants, ever since. I told her that once you see Paris, it stays with you always, a longing that doesn’t go away. After Paris, we had a quick two weeks in the Oslo, the highlight of course being the Aurora Borealis in the Lofoten Islands. Many people in Oslo, who’d lived their whole lives there, said it was rare to see them, and that we’d been very lucky. We couldn’t agree more! I won’t forget it for the rest of my life. We had a very quick, albeit unsettling four days in Amsterdam where I fell into a tour boat within three hours of landing. But a house call from a sports medicine doctor, who declared me stable, but perhaps clumsy, helped to calm us back down. A lot of Rest, Ice, Compression & Elevation had me walking a couple of days later, although I’m still on the mend, and Bruce is guarded at all times about me being Careful. The result is that I no longer have to help lift the 270 pounds of luggage or carry in groceries! But all was not lost as we got out for a second attempt at a boat tour along with a visit to the Van Gogh Museum. We then spent three days in the magical Belgium cities of Ghent and Bruges, which are filled with fairytale canals, architecture and chocolate. And so on Sunday, with our hopes high, we drove south into France, passing through the champagne capital of Reims, arriving at our little rented house, or Gite as it’s known in France, for the rest of our Europe sabbatical. Finally, a place to completely unpack the luggage and stop for a while. Sunday was a trip into town for the farmer’s market, and yesterday, I literally did nothing. Bruce did some work and had a couple of conference calls, and I tried to write, but mostly, I just looked out at the river, which shimmers reflections onto the living room ceiling, and listened to the ducks and the cathedral bells, while doing some PT on my knee. Last night, with the chilly night air coming in, we streamed the movie Sleepy Hollow wide onto our living room wall with our little traveling projector, a perfect ending to a peaceful day. In the movie “Under The Tuscan Sun”, she recommends taking your time to introduce yourself to a new house. Go slowly and get to know each other. It’s true. The house has low beams where Bruce has to duck a little, and there are steps in every direction, so I’m taking my time, getting to know the lights and the shower and the cubbies and the dressers. 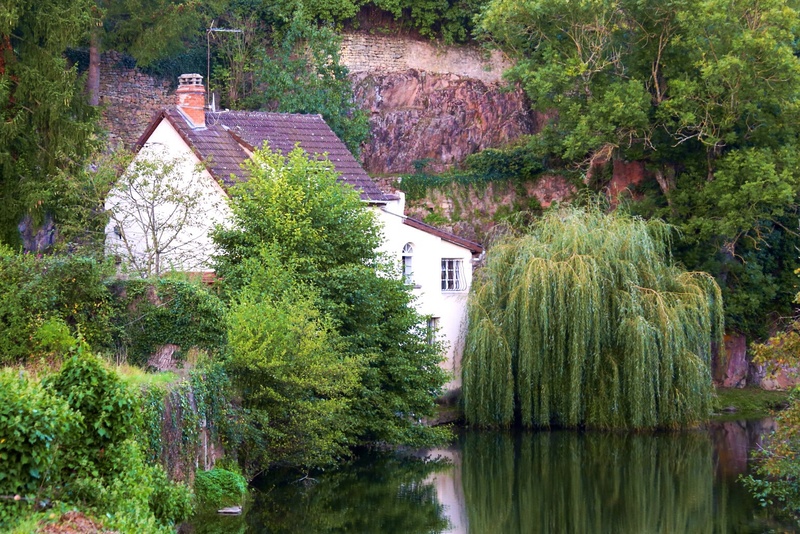 The house creaks in the night, so I wonder if there are ghosts or just the movement of the tide along the river. It’s all good. It’s a really nice place to be. Today we ventured back out for a big shop in town. Our first stop was at L’Epicerie Chez Serge, a magical little French speciality shop in town full of local produce, jars and tins of everything imaginable, racks of wine, and some more cheeses. We spent some time explaining that we were renting a house for six weeks, and they warmed up to us fairly quickly. By the end, Serge even threw in some complimentary sausage for us to try and will call us tomorrow morning with the price of Dover Sole from the fish market in Dijon. He explained that sole is expensive here this time of year. 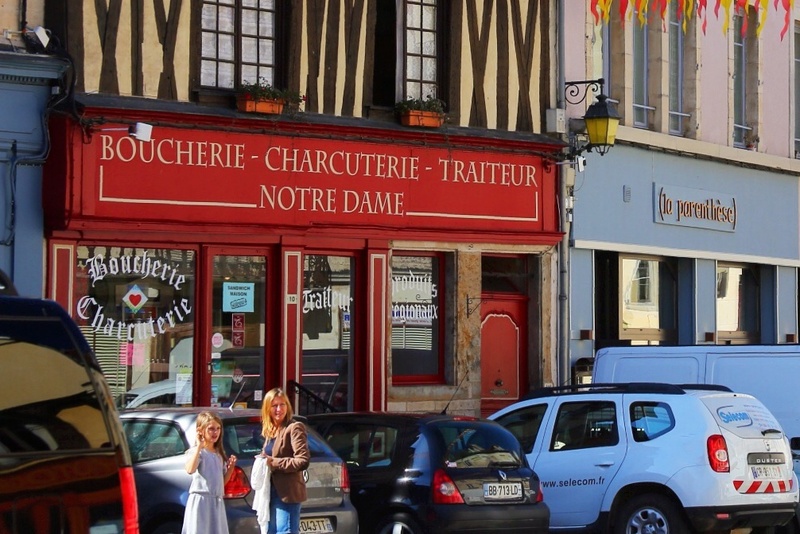 Our second stop was to the local butcher or Boucherie for a few items including bacon (porc de fume), Jambon ham, and chuck for a little Boeuf Bourguignon later in the week. The woman warmly told us she could speak English, but we tried our hardest to continue on in French. Her husband came out to cut the beef for us, turning to see if he had the right amount. As we left she wished us Au Revoir! And then on to Auchon, a larger grocery store, where nobody seemed to speak English, but we got by with our best pigeon French. We forgot to weigh our own produce so the woman helped us out. The man checking us out kept asking for a passport, and in the end, we think he meant we needed to wait while someone was doing a price check. It was very confusing, but we made it out alive, and our kitchen counter is now full of bottles of wine and the larder is stocked. We had planned to venture out later to see the nearby village of Flaviney sur Ozerain where parts of the movie Chocolat was filmed, but in the end it will have to wait for another day, as we’re back at our little place relaxing by the river. For lunch, Bruce roasted whole “Rose Trout”, accompanied by local heirloom tomatoes and just a little Pouligney Montrachet. 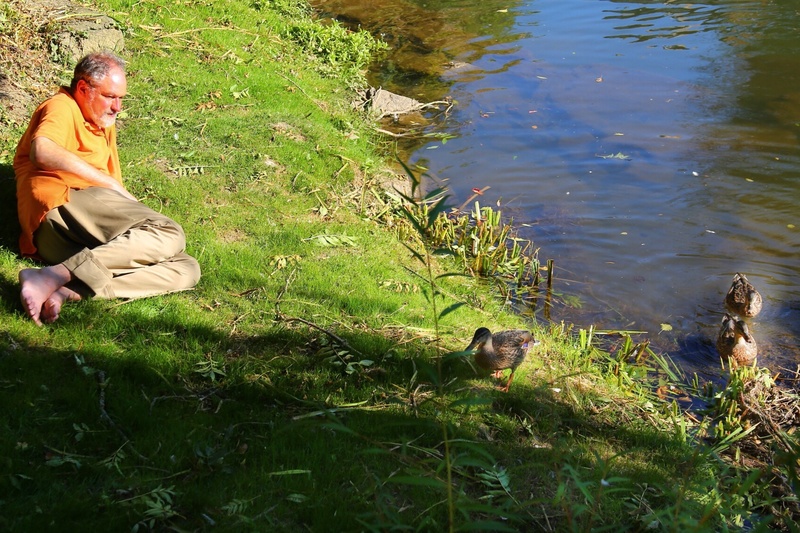 After a nap, he fed our little group of ducks beside the river. Thursday, my sister Debbie and her partner Lori arrive for four days. They’ve been in Paris for a week, and I’m sure will be ready for a little down time by the river too, along with a little drive through the Burgundy countryside. So, as we head into the autumn, we’re very relaxed and just happy to be here. The ducks are happy we’re here too! And who knows what adventures await us next!